Aldehyde oxidase-mediated oxidation of N1-methylnicotinamide to N1-methyl-2-pyridine-5-carboxamide (2-PY) and N1-methyl-4-pyridone-5-carboxamide (4-PY) in chimeric mice constructed by transplanting human hepatocytes into urokinase-type plasminogen activator-transgenic severe combined immunodeficient mice was examined in vivo and in vitro. The activity in liver cytosol of chimeric mice with a high replacement index was approximately 4-fold higher than that in control mice. Furthermore, the oxidation products in control mice were 2-PY and 4-PY, whereas, in chimeric mice, the major product was 2-PY, as in humans. The aldehyde oxidase in chimeric mouse liver was confirmed to be of human type by immunoblotting analysis. The ratio of pyridones (2-PY/4-PY) excreted in the urine of chimeric mice was closer to that of humans than to that of control mice. Thus, the aldehyde oxidase in chimeric mice has human-type functional characteristics. Tateno et al. (2004) established chimeric mice in which the liver was almost completely repopulated with human hepatocytes. Such mice should be an excellent in vivo model for predicting drug metabolism, drug-drug interactions, drug induction, and inhibition of drug-metabolizing enzymes in humans. Katoh et al. (2004, 2005b) reported that the patterns of cytochrome P450 isoforms and phase II enzymes, such as UDP-glucuronosyltransferase, sulfotransferase, N-acetyltransferase, and glutathione S-transferase, in chimeric mice having a nearly 90% replacement rate with human hepatocytes were almost identical with those in human liver, and they used these mice to estimate the in vivo induction of cytochrome P450 enzymes in humans (Katoh et al., 2005a). Nishimura et al. (2005) reported that hepatocytes from chimeric mice with nearly completely humanized liver are useful for predictive screening of the induction potency of new drugs on drug-metabolizing enzymes in humans. We were interested in knowing whether drug metabolism by a cytosolic drug-metabolizing enzyme, aldehyde oxidase, in these mice is also similar to that in humans. Aldehyde oxidase (EC 1.2.3.1) contains flavin adenine dinucleotide, molybdenum, and iron-sulfur centers. It has been suggested to be relevant to the pathophysiology of a number of clinical disorders (Berger et al., 1995; Wright et al., 1995; Moriwaki et al., 1997). The enzyme in liver of various species catalyzes the oxidation of various aldehydes and nitrogenous heterocyclic xenobiotics, such as methotrexate and cyclophosphamide (Beedham, 1985; Kitamura et al., 2006), and also catalyzes the metabolism of physiological compounds, such as retinaldehyde (Huang and Ichikawa, 1994). However, there are marked species differences and strain differences of the enzyme activities for oxidative reaction in rats and mice (Beedham, 1985; Schofield et al., 2000; Kitamura et al., 2006; Sugihara et al., 2006). This has presented problems in preclinical studies. Many aldehyde oxidase substrates, such as methotrexate and phthalazine, show similar metabolic profiles among different species, though the level of the oxidase activity is species-dependent (Beedham, 1985; Kitamura et al., 1999, 2006). However, other substrates, such as famciclovir, 6-deoxypenciclovir, quinoxaline, 2-aminopteridine, and N1-methylnicotinamide (NMN), show species differences in the metabolic profile (Beedham, 1985; Rashidi et al., 1997; Kitamura et al., 2006). We thought that NMN, which shows different metabolic profiles in mice and humans, would be the most suitable substrate for the present purpose. NMN, which is formed from nicotinamide by nicotinamide N-methyltransferase, is widely distributed in animals (Yan et al., 1997), and its metabolism to N1-methyl-2-pyridone-5-carboxamide (2-PY) and N1-methyl-4-pyridone-3-carboxamide (4-PY) is catalyzed by aldehyde oxidase. However, the ratio of pyridones (2-PY/4-PY) formed from NMN varies among species. For example, 2-PY is mainly formed in humans, whereas 2-PY and 4-PY are equally formed in mice (Kitamura et al., 2006). In this study, we examined the characteristics of aldehyde oxidase activity in control mice and chimeric mice with a humanized liver by using NMN as a substrate. We demonstrated that oxidation of NMN in high-replacement chimeric mice showed a human-type pattern rather than a mouse-type pattern. Chemicals. NMN, N′-methylnicotinamide, and benzaldehyde were obtained from Tokyo Chemical Industry Co., Ltd. (Tokyo, Japan), and 2-PY and 4-PY were prepared by the reported method (Sugihara et al., 2006). Animals. Chimeric mice with humanized liver using human hepatocytes were prepared according to Tateno et al. (2004). Human hepatocytes were transplanted into albumin promoter/enhancer-driven urokinase-type plasminogen activator-transgenic severe combined immunodeficient mice (uPA+/+/SCID mice, 20–30 days after birth). The human hepatocytes progressively repopulated the host liver. Donor hepatocytes used in this study were obtained from BD Biosciences (San Jose, CA). The replacement index (RI) of human hepatocytes, required to estimate the degree of humanization of the liver in chimeric mice, was determined by measuring the levels of human albumin in blood collected periodically from the tail vein with a latex agglutination assay (Eiken Immunochemical Laboratory, Tokyo, Japan). The uPA+/+/SCID mice were generated by crossing uPA mice [B6SJL-TgN(Alb1Plau)144Bri; The Jackson Laboratory, Bar Harbor, ME] with SCID mice (Fox Chase SCID C.B-17/Icr-scid Jcl; CLEA Japan Inc., Tokyo, Japan). The mice were housed in cages at 22°C with a 12-h light/dark cycle with free access to tap water and a standard pellet diet, MM-3 (Funabashi Farm, Funabashi, Japan). The present study was approved by the Ethics Committees of Hiroshima University. Administration of NMN to Mice. NMN dissolved in saline (50 mg/ml) was administered to mice orally at a single dose of 50 mg/kg. After treatment, urine was collected at 24, 48, and 72 h.
Preparation of Liver Cytosol. Livers were excised from control (uPA+/+/SCID mice) and chimeric male mice (6–8 weeks after transplantation) and homogenized in four volumes of 1.15% KCl. The cytosolic fraction was obtained from the homogenate by successive centrifugation at 9,000g for 20 min and 105,000g for 60 min. Immunoblot Analysis of Aldehyde Oxidase. Aldehyde oxidase protein was determined by immunoblot analysis of mouse liver cytosolic protein. Mouse microsomal proteins (5 μg) were separated on SDS-polyacrylamide gel electrophoresis (10% gel) and transferred to polyvinylidene fluoride membranes (Bio-Rad, Hercules, CA) by electroblotting. Membranes were then incubated with 5% skimmed milk in 25 mM tris-buffered saline (pH 7.6) - 0.1% Tween 20 for 1 h and probed with an anti-rat aldehyde oxidase (1:1000) for 3 h. The membranes were washed, and antibody binding was detected with horseradish peroxidase-conjugated goat anti-rabbit IgG, followed by development with ECL Plus (GE Healthcare, Buckinghamshire, England). Assay for Aldehyde Oxidase Activity. Aldehyde oxidase activity was measured with NMN as a substrate according to the reported method (Sugihara et al., 2006). The amounts of 4-PY and 2-PY formed were measured by high-performance liquid chromatography (HPLC). Briefly, the incubation mixture consisted of 0.2 μmol of NMN and liver cytosol equivalent to 50 to 100 mg of liver wet weight in a final volume of 1 ml of 0.1 M K, Na-phosphate buffer (pH 7.4). Incubation was performed at 37° for 10 min, then 10 μgof N′-methylnicotinamide (an internal standard) was added as an internal standard, and the whole was extracted with ethyl acetate. The extract was subjected to analysis by HPLC. Measurement of NMN, 2-PY, and 4-PY Excreted in Urine. NMN, 2-PY, and 4-PY in the urine of mice were determined according to the reported method (Sugihara et al., 2006). Briefly, to measure 2-PY and 4-PY, 10 μgof N′-methylnicotinamide (an internal standard) and 0.6 g of KCO3 were added to a mixture of urine (0.1 ml) and water (0.4 ml), and the solution was extracted with diethyl ether. The extract was evaporated to dryness, and the amounts of 2-PY and 4-PY were determined by using HPLC. To measure NMN, urine (0.01 ml) was added to a mixture of 1 ml of 0.2 M isonicotinamide and 0.5 ml of 0.1 M acetophenone. One milliliter of 6 N NaOH and 0.5 ml of formic acid were added, and the solution was left to stand on ice for 10 min. Then, the mixture was boiled in a water bath for 5 min. The amount of fluorometric compound, 1-methyl-7-phenyl-15-dehydro-5-oxo-1,6-naphthyridine, formed from NMN and acetophenone was determined by means of HPLC as described below. RP Values in Control and Chimeric Mice. The ratio of the amounts of the pyridones to the total amounts of NMN and the pyridones excreted in the urine (RP) was calculated to estimate the aldehyde oxidase level in vivo in mice. The calculation was RP (%) = [(2-PY + 4-PY)/(2-PY + 4-PY + NMN)] × 100. HPLC. HPLC was performed using a Hitachi L-6000 chromatograph (Hitachi Co. Ltd., Tokyo, Japan) fitted with a Capcell Pak C18 UG120 column (25 cm × 4.6 mm; Shiseido Co. Ltd., Tokyo, Japan) for the separation of 2-PY and 4-PY. The mobile phase was acetonitrile-water (3:97, v/v). The chromatograph was operated at a flow rate of 0.5 ml/min and with a detection wavelength of 254 nm. The elution times of 4-PY, 2-PY, and N′-methylnicotinamide were 13.5, 14.7, and 30.0 min, respectively. The detection limit for both 4-PY and 2-PY was 0.05 nmol/ml urine. The limit of quantification for both 4-PY and 2-PY was 0.2 nmol/ml urine. For the detection of NMN, a LiChrospher Select B column (15 cm × 4.6 mm; Merck Co. Ltd., Tokyo, Japan) was used, and the mobile phase was acetonitrile-0.1 M KH2PO4 (1:4, v/v). The chromatograph was operated at a flow rate of 0.5 ml/min, with fluorometric detection (excitation at 382 nm and emission at 440 nm). The elution time of 1-methyl-7-phenyl-15-dehydro-5-oxo-1,6-naphthyridine was 6.2 min. The amount of the product was determined from the specific peak area of the fluorometric derivatives by using a standard curve. The detection limit was 0.02 nmol/ml urine. The limit of quantification was 0.1 nmol/ml urine. NMN oxidase activity of aldehyde oxidase in liver cytosols of chimeric mice. NMN oxidase activity and ratio of pyridones (2-PY/4-PY) (values in parentheses) formed from NMN in liver of chimeric mice with various values of replacement index with human hepatocytes (RI) are shown. Each column represents the mean of duplicate determinations, and data from SCID and uPA+/+/SCID mice are shown as means and +S.D. NMN oxidase activity was assayed using HPLC, as described under Materials and Methods. Characterization of Aldehyde Oxidase in Chimeric Mouse Liver. When NMN was incubated with liver cytosols of control (uPA+/+/SCID) mice with no human hepatocytes and of chimeric mice having 80 to 90% replacement with human hepatocytes, a marked difference of pyridone formation was observed. The amounts of 2-PY and 4-PY formed were approximately the same in liver cytosol of control mice, but 2-PY was the major metabolite in that of the chimeric mice. The oxidase activities of these liver cytosols toward NMN were also different. The activity in high-RI chimeric mice was approximately 4-fold higher than that in control mice. Specifically, in chimeric mice with various levels of human hepatocyte replacement (0, 0–10, 20–30, 30–40, 40–50, 60–70, and 80–90%), the activity and the ratio of pyridones (2-PY/4-PY) formed were well correlated with the hepatocyte RI, which was assessed in terms of human albumin concentration in blood, as noted before (Fig. 1). The ratio of pyridones formed by liver cytosol of chimeric mice having 80 to 90% replacement with human hepatocytes was close to that of pooled human liver cytosol. Further characterization of aldehyde oxidase in these liver cytosols was conducted by Western blot analysis using aldehyde oxidase antibody. The pattern is similar to the reported data (Sugihara et al., 1997) and shows that human liver-type aldehyde oxidase was present in the chimeric mice (Fig. 2). These facts suggest that aldehyde oxidase in liver of the chimeric mice is functionally a human-type aldehyde oxidase. Western blots of mouse and human liver cytosol probed with anti-rat aldehyde oxidase antibody. Detection of NMN, 2-PY, and 4-PY in Urine of Control (uPA+/+/SCID) and Chimeric Mice. We previously reported that aldehyde oxidase levels in animals in vivo could be estimated by measuring the ratio of the amounts of the pyridones to NMN in the urine (RP value) (Sugihara et al., 2006). The ratio of pyridones (2-PY/4-PY) generated from NMN was species-specific in many animals, including humans. We therefore measured the amounts of NMN, 2-PY, and 4-PY excreted in the urine of control (uPA+/+/SCID) and chimeric mice, and the RP value and the ratio of pyridones (2-PY/4-PY) were calculated as described under Materials and Methods. The RP values and the ratio (2-PY/4-PY) in control and chimeric mice showed clear differences. Amounts of 2-PY and 4-PY excreted in the urine of control (uPA+/+/SCID) mice were approximately equal. 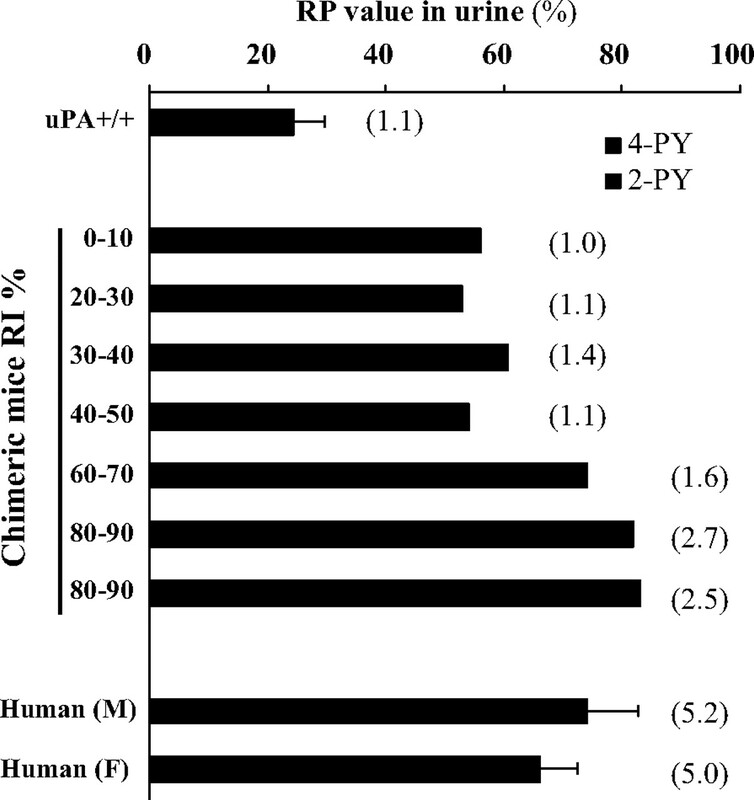 In contrast, the level of 2-PY in chimeric mice was higher than that in control mice, and the level increased with the increasing human hepatocyte replacement ratio in chimeric mice (Fig. 3). This result showed that aldehyde oxidase in the chimeric mice functions as a human-type aldehyde oxidase in vivo. 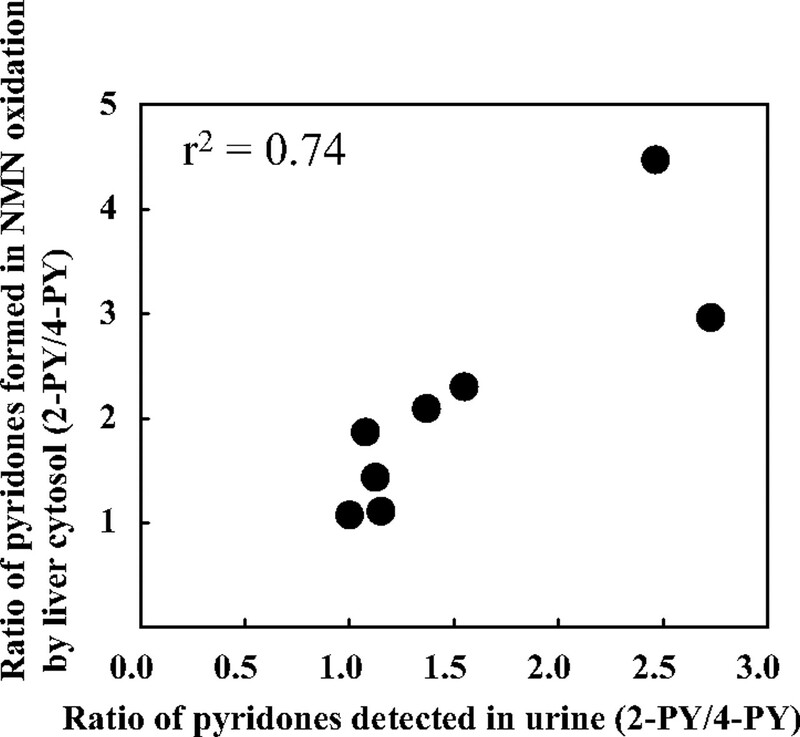 The ratio of pyridones in mouse urine (Fig. 3) was well correlated with that formed in in vitro NMN oxidation by liver cytosol of the same mice (Fig. 1): the correlation coefficient was 0.74 (Fig. 4). However, the formation ratio of 2-PY to 4-PY in in vitro NMN oxidation was much higher than that in urine. In Vivo Metabolism of NMN to 2-PY and 4-PY in Chimeric Mice after Administration of NMN. NMN was administered to chimeric mice, and the excretion patterns of NMN, 4-PY, and 2-PY in the urine were determined. After administration of NMN, the amount of unchanged NMN excreted in the urine was in the order of RI = 0 to 10, 30 to 40, and 80 to 90% mice. 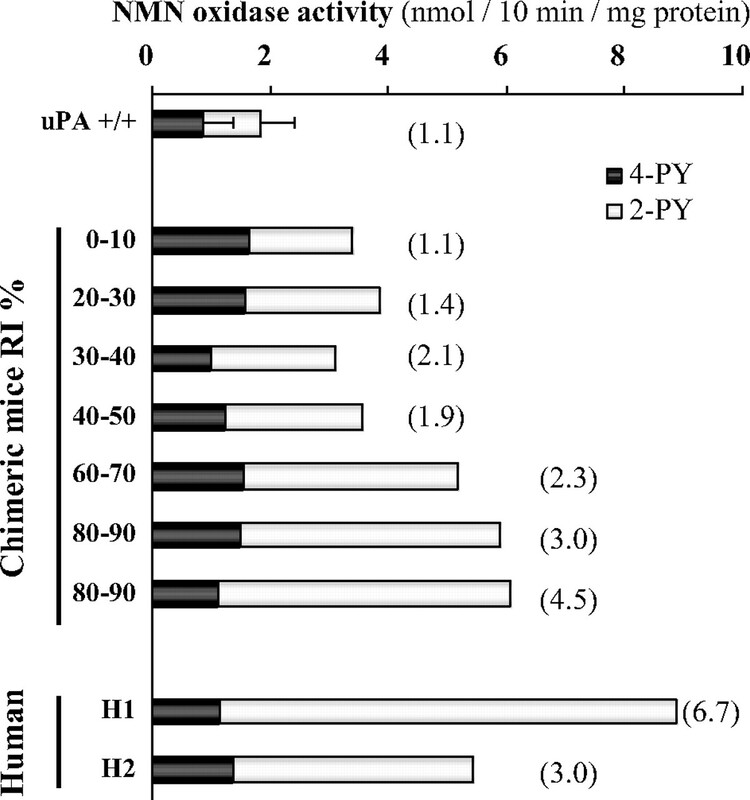 The ratio of 2-PY and 4-PY excreted in the urine of low-RI chimeric mice (RI = 0–10%), moderate-RI chimeric mice (RI = 30–40%), and high-RI chimeric mice (RI = 80–90%) was 1.0, 1.5, and 2.0, respectively. The amount of 2-PY in the urine of RI = 0 to 10% mice was also slightly higher than that of 4-PY, and the amount of parent NMN in RI = 0 to 10% mice was higher than that of high-RI mice (Fig. 5). The amounts in nontreated urine were less than one nanomole per day, so the excreted NMN and pyridones were concluded to have been metabolites of administered NMN. This supports the view that NMN and pyridones excreted in the urine reflect the in vivo metabolism of NMN in the chimeric mice. We have shown here that a cytosolic drug-metabolizing enzyme, aldehyde oxidase, in chimeric mice having high replacement levels of human hepatocytes functions as human-type aldehyde oxidase both in vivo and in vitro. Specifically, the metabolizing ability toward NMN and the conversion pattern of NMN to pyridones (2-PY and 4-PY) in the high-RI chimeric mice resembled those in humans in vivo and in vitro, being different from those in the control mice, in accordance with the reported species difference (Kitamura et al., 2006). Therefore, these chimeric mice should be useful in preclinical drug metabolic studies. N1-Methylnicotinamide (NMN) and pyridones excreted in the urine of chimeric mice. RP values and ratio of pyridones (2-PY/4-PY) (values in parentheses) excreted in the urine of chimeric mice with various values of RI are shown. Each column represents the mean of duplicate determinations. Amounts of NMN and pyridones excreted in the urine were measured using HPLC, as described under Materials and Methods. Correlation of the ratio of pyridones (2-PY/4-PY) detected in urine and in NMN oxidation by liver cytosol of the same mice. The data were taken from Figs. 3 and 1, respectively. Recently, aldehyde oxidase homologs 1 and 2, which may have different metabolic roles, were identified in mice (Terao et al., 2000; Garattini et al., 2003). In humans, subtypes of aldehyde oxidase have not been identified, though bands found by Western blot analysis of liver cytosol in human and chimeric mice using aldehyde oxidase antibody may be due to human subtypes. We found two main and two minor bands of aldehyde oxidase by Western blot analysis of aldehyde oxidase in human and monkey livers (Sugihara et al., 1997). It is also important to consider the source of hepatocyte used to prepare chimeric mice, because interindividual variations of aldehyde oxidase activity are known to occur in humans (Rodrigues, 1994; Sugihara et al., 1997; Tayama et al., 2007). Chimeric mice should be a useful model for predicting drug metabolism in humans, but the role of enzyme activity in extrahepatic organs must be taken into account. The ratio of pyridones (2-PY/4-PY) formed from NMN by liver cytosol of chimeric mice was well correlated with that in urine of the same mice, but the values in vitro were higher than those in vivo (Fig. 4). This result suggests that other extrahepatic enzymes may play a role. Aldehyde oxidase also is known to exist in organs other than the liver. Nevertheless, liver aldehyde oxidase is the major determinant of urinary metabolites of NMN in vivo, judging from the results of the present study. In preclinical tests using chimeric mice, it will be important to confirm that this remains the case in vivo for the test compounds. N1-Methylnicotinamide (NMN) and pyridones excreted in the urine of chimeric mice treated with NMN (50 mg/kg). Accumulation of NMN, 2-PY, and 4-PY in the urine of chimeric mice [RI = 80–90% (A), RI = 30–40% (B), and RI = 0–10% (C)]. Each value represents the mean of duplicate determinations. Amounts of NMN and pyridones excreted in the urine were measured using HPLC, as described under Materials and Methods. In conclusion, chimeric mice having high levels of replacement with human hepatocytes in the liver expressed functionally humantype aldehyde oxidase. These mice with humanized liver should be a useful model in studies of drug metabolism involving aldehyde oxidase. This work was supported by a Grant-in-Aid for Scientific Research from the Japanese Ministry of the Environment and the Japan Society for the Promotion of Science. ABBREVIATIONS: NMN, N1-methylnicotinamide; 2-PY, N1-methyl-2-pyridone-5-carboxamide; 4-PY, N1-methyl-4-pyridone-3-carboxamide; HPLC, high-performance liquid chromatography; RP value, the ratio of the amounts of pyridones to the total amounts of NMN and pyridones; uPA+/+/SCID, urokinase-type plasminogen activator-transgenic severe combined immunodeficient; RI, replacement index. Beedham C (1985) Molybdenum hydroxylases as drug-metabolizing enzymes. Drug Metab Rev 16: 119-156. Berger R, Mezey E, Clancy KP, Harta G, Wright RM, Repine JE, Brown RH, Brownstein M, and Patterson D (1995) Analysis of aldehyde oxidase and xanthine dehydrogenase/oxidase as possible candidate genes for autosomal recessive familial amyotrophic lateral sclerosis. Somat Cell Mol Genet 21: 121-131. Garattini E, Mendel R, Romao MJ, Wright R, and Terao M (2003) Mammalian molybdo-flavoenzymes, an expanding family of proteins: structure, genetics, regulation, function and pathophysiology. Biochem J 372: 15-23. Huang DY and Ichikawa Y (1994) Two different enzymes are primarily responsible for retinoic acid synthesis in rabbit liver cytosol. Biochem Biophys Res Commun 205: 1278-1283. Katoh M, Matsui T, Nakajima M, Tateno C, Kataoka M, Soeno Y, Horie T, Iwasaki K, Yoshizato K, and Yokoi T (2004) Expression of human cytochromes P450 in chimeric mice with humanized liver. Drug Metab Dispos 32: 1402-1410. Katoh M, Matsui T, Nakajima M, Tateno C, Soeno Y, Horie T, Iwasaki K, Yoshizato K, and Yokoi T (2005a) In vivo induction of human cytochrome P450 enzymes expressed in chimeric mice with humanized liver. Drug Metab Dispos 33: 754-763. Katoh M, Matsui T, Okumura H, Nakajima M, Nishimura M, Naito S, Tateno C, Yoshizato K, and Yokoi T (2005b) Expression of human phase II enzymes in chimeric mice with humanized liver. Drug Metab Dispos 33: 1333-1340. Kitamura S, Sugihara K, Nakatani K, Ohta S, Oh-hara T, Ninomiya S, Green CE, and Tyron CA (1999) Variation of hepatic methotrexate 7-hydroxylase activity in animals and humans. IUBMB Life 48: 607-611. Kitamura S, Sugihara K, and Ohta S (2006) Drug-metabolizing ability of molybdenum hydroxylases. Drug Metab Pharmacokinet 21: 83-98. Moriwaki Y, Yamamoto T, and Higashino K (1997) Distribution and pathophysiologic role of molybdenum-containing enzymes. Histol Histopathol 12: 513-524. Nishimura M, Yokoi T, Tateno C, Kataoka M, Takahashi E, Horie T, Yoshizato K, and Naito S (2005) Induction of human CYP1A2 and CYP3A4 in primary culture of hepatocytes from chimeric mice with humanized liver. Drug Metab Pharmacokinet 20: 121-126. Rashidi MR, Smith J, Clarke S, and Beedham C (1997) In vitro oxidation of famciclovir and 6-deoxypenciclovir by aldehyde oxidase from human, guinea pig, rabbit, and rat liver. Drug Metab Dispos 25: 805-813. Rodrigues AD (1994) Comparison of levels of aldehyde oxidase with cytochrome P450 activities in human liver in vitro. Biochem Pharmacol 48: 197-200. Schofield PC, Robertson IGC, and Paxton JW (2000) Inter-species variation in the metabolism and inhibition of N-[(2′-dimethylamino)ethyl]acridine-4-carboxamide (DACA) by aldehyde oxidase. Biochem Pharmacol 59: 161-165. Sugihara K, Kitamura S, Tatsumi K, Asahara T, and Dohi K (1997) Differences in aldehyde oxidase activity in cytosolic preparations of human and monkey liver. Biochem Mol Biol Int 41: 1153-1160. Sugihara K, Tayama Y, Shimomiya K, Yoshimoto D, Ohta S, and Kitamura S (2006) Estimation of aldehyde oxidase activity in vivo from conversion ratio of N1-methylnicotinamide to pyridones, and intraspecies variation of the enzyme activity in rats. Drug Metab Dispos 34: 208-212. Tateno C, Yoshizane Y, Saito N, Kataoka M, Utoh R, Yamasaki C, Tachibana A, Soeno Y, Asahina K, Hino H, et al. (2004) Near completely humanized liver in mice shows human-type metabolic responses to drugs. Am J Pathol 165: 901-912. Tayama Y, Miyake K, Sugihara K, Kitamura S, Kobayashi M, Morita S, Ohta S, and Kihira K (2007) Developmental changes of aldehyde oxidase activity in young Japanese children. Clin Pharmacol Ther 81: 567-572. Terao M, Kurosaki M, Saltini G, Demontis S, Marini M, Salmona M, and Garattini E (2000) Cloning of the cDNAs coding for two novel molybdo-flavoproteins showing high similarity with aldehyde oxidase and xanthine oxidoreductase. J Biol Chem 275: 30690-30700. Wright RM, Vaitaitis GM, Weigel LK, Repine TB, McManaman JL, and Repine JE (1995) Identification of the candidate ALS2 gene at chromosome 2q33 as a human aldehyde oxidase gene. Redox Rep 1: 313-321. Yan L, Otterness DM, Craddock TL, and Weinshilboum RM (1997) Mouse liver nicotinamide N-methyltransferase. Biochem Pharmacol 54: 1139-1149.